Chinese e-commerce giant Taobao has removed a number of popular cosmetics products from sale after the nation’s medical regulator announced a marketing term which blends the words for “cosmetics” and “pharmaceuticals” constituted an untested claim of medical efficacy. China’s National Medical Products Administration, the top drug and device regulator, reasserted last month (link in Chinese) that it was unlawful to make medical claims about cosmetics in advertising and on packaging, citing a regulation that has been in effect since 1990 but has been widely ignored. “Cosmeceuticals” (known as “yaozhuang” in Chinese) are a range of cosmetic products including whitening creams and hair loss tonics that manufacturers have long touted as having medical benefits, but which are not approved as drugs. Experts say the term can mislead consumers into believing the products are tested, regulated and approved in the same way as medicines. 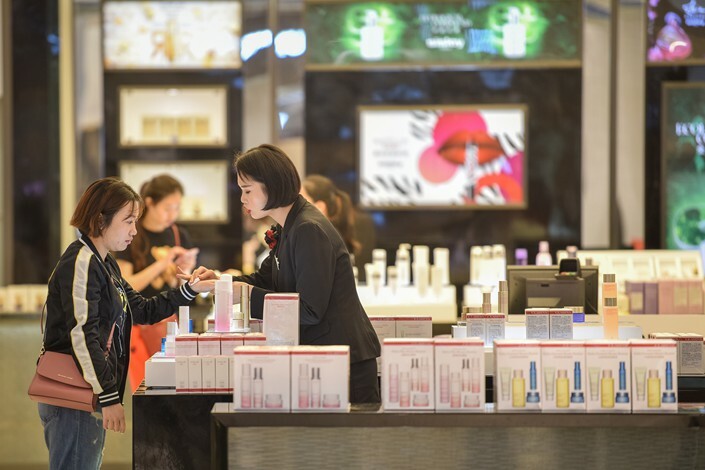 The Chinese cosmeceuticals market hit 62.5 billion yuan ($9.29 billion) in 2017, up 6.5% from the previous year, according to a report from online market research consultancy Qianzhan. On Friday, Caixin could find no products labeled as cosmeceuticals on Alibaba’s Taobao or on Suning.com. An Alibaba representative told Caixin the company had delisted products bearing the title. However, products labeled as cosmeceuticals were still available on Alibaba’s business-to-consumer retail site Tmall on Friday, as well as on other online shopping sites including JD.com and NetEase’s Kaola. China is not the only country to wage war on misleading cosmetic advertising. The U.S. Food and Drug Administration said in 2017 that the term “cosmeceutical” had “no meaning under the law.” The EU regulates cosmetics with medical benefits as medicines. In China, cosmetics are divided into two categories: non-special use cosmetics, and special-use cosmetics. Selling special-use cosmetics — which include certain hair products, “breast-shaping” products, deodorizers, spot-removal creams and more — requires a license issued by the National Medical Products Administration. These are often touted as cosmeceuticals, says Zhao Guoqing, CEO of industry analysis startup Yan An Tang. “They have a much simpler approval process than pharmaceuticals,” Zhao says, adding that associating them with approved pharmaceutical drugs could mislead customers. Zhao said cosmeceuticals such as skin-whitening products were not likely to be approved for pharmaceutical use because they do not treat disease. The crackdown is the latest in a string of steps to tighten oversight of China’s health care sector. In December, the State Administration for Market Regulation took aim at marketing by direct sellers of health care products after Tianjin-based Quanjian, a manufacturer of herbal remedies and health foods, was accused of misleading advertising that contributed to a child’s death.